On behalf of the entire Rockland Community College family, I want to welcome you all here today. At RCC, we take the word “community” in our title very seriously, and you are an important part of our community. We are honored to be the hosting venue for this important Yom Hashoah Commemoration. This remembrance is an important occasion for all of us, not just for those who are Jewish. For the subjugation and persecution and genocide of any group during the Holocaust, and even in modern times, is, or should be, abhorrent to all people. 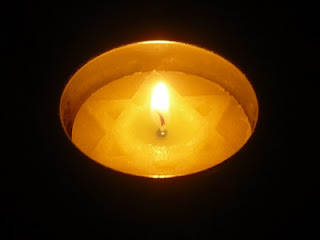 In commemorating Yom Hashoah, we remember what happened. In remembering what happened, we are reminded that such a thing can happen. By that reminder, we are encouraged and hopefully inspired to be sure to do our part, both as individuals and as a community, to prevent such a thing from ever happening again. We have to educate ourselves about what happened and how it happened so that we can be alert to the signs of hate and prejudice that foster crimes against humanity like the Holocaust. In coming together to commemorate what was terrible, we become a critical mass that is standing up for goodness, for right, and for humanity itself. Our remembrance here today gives us hope that we, by our example, by our never forgetting, will teach others why they, too, should always remember. The remembrance and recognition can lead to prevention. And so we are here this evening to remember the stars who continue to light our way. As we remember the Holocaust, we must also acknowledge what is happening in our own time. All these years later, incidents of hate, intolerance and discrimination continue to flare against those who are different in race, religion, lifestyle, creed or practice. We must all, as individuals and communities, commit ourselves to the practice of acts of kindness, tolerance and respect for the dignity and humanity of all human beings. Welcome to Rockland Community College, where we are truly one community.